I am always on the look out for books for my older children. I stumbled across Beneath by Roland Smith and it was the perfect summer afternoon read. Two brothers, Pat and Cooper, are quite different. Cooper (the older brother) is a bit of loner who doesn’t see the need for phones or computers. The underground, however, is the focus of Cooper’s energy. It is as if something draws him there. Even with his loner mentality, Cooper loves his young brother, Pat. While they are so very different, they have a strong brotherly bond. Cooper and Pat spend most of their time together as their parents are disengaged from interacting with them and more focused on work. It appears that Cooper and Pat are a disappointment to their parents by being “average”. Then one day there is an accident that leads to a fight between Cooper and his parents. Pat is devastated that Cooper has run away and left him behind. Finally after a year, Cooper makes contact with Pat and just as suddenly the contact ends. Pat decides that he is going to travel to New York City to find his brother. This quest to find his brother leads Pat on an adventure to the “underneath”. Under the streets of New York City there is a thriving community of people who prefer to live underground. This is where Cooper was suppose to be, this is where Pat was to be reunited with his brother. Cooper is not there. He has ventured into The Deep….. 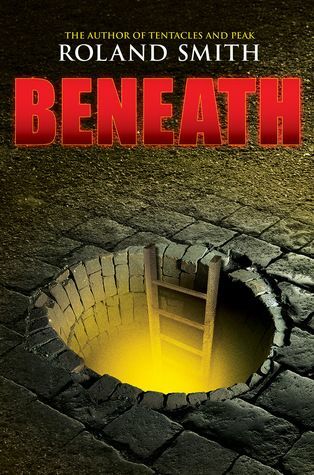 Beneath is a great read for those who enjoy an exciting adventure. The pace was steady, the main characters were likeable, and the plot was intriguing. While disappointed with the relationship between the parents and boys, I loved seeing the close relationship between brothers. Love, friendship, and sacrifice in the face of the unknown and the dangerous. My three oldest children (16, 15, 13) all read Beneath and enjoyed it. We all look forward to the sequel. There is definitely going to be a sequel, right Mr. Smith? Beneath gets the Tribe’s Two Thumbs Up for readers twelve and up who love a good adventure. For those who have boys who need some summer reading, Beneath is a great one to add to the list. This entry was posted in Book Reviews, Books, Something to Share and tagged Books, boys, literature, reading by sweetie. Bookmark the permalink.